This entry was posted in General Political Science and tagged 1972, George McGovern, James Garfield, Shirley Chisholm. Bookmark the permalink. I think she is trying to send a message of that she doesn’t take any nonsense from anyone and is a strong woman. She wanted everyone to be under one roof and operating at the same time. No separate parties, and she was unbossed meaning that she was her own boss and she was going to call the shots for the country. I believe her message is that she is a strong, independent woman who doesn’t take orders from anyone. That she wants to bring everyone in the United States together as one. When she says she is unbought she means that no one owns her and can tell her what to do. When she says she is unbossed she is saying no one but herself is going to make the calls on how to run the nation. Her point was to try and get everyone together as a whole to become a nation hand in hand. I think she is showing she is superior and capable of being independent and ruling the country. She wants things her way, and she has to live up to that. Sounds like she is trying to bring people in as One and whole. I think the message that she is trying to convey is that she will not give up and she will fight till the last minute. Many people were inspired by her courage and looked up to her. She had a goal to establish a new era in American history. I think her message is that she will not be OWNED!!! I think that she was showing that she was a free-thinker, who followed her own rules and wouldn’t put herself or her constituents in a position where her vote wasn’t worth anything, because it had already been bartered away. I don’t think she engaged in political shenanigans, and basically was a “what you see what is you get” politician. I think Chisholm is trying to unite the people of the United States in the sense that she wants your vote regardless of your party affiliation. She makes it clear that she will not fall to corruption when she uses the word, “unbought.” She also conveys that she being independent wouldn’t be an issue for her if she were to be elected president. 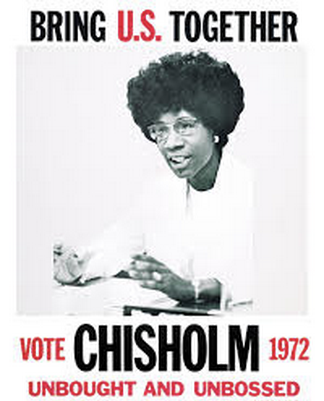 I believe Chisholm is trying to get the message across that she wants the United States to work together. You could read the sign as “bring us together”. I also think the “unbought and “”unbossed” means she is very independent and nobody is controlling her. In my opinion, i think Chisholm is trying to sent the message that a kind of tenacious spirit. She hopes to people unity and harmonious government. I think she is showed that she was a free thinker, she has her own rules. I like her statement, let us go together to show she is eager to a prosperous and harmonious society. I believe Chrisholm is trying to show that she is a strong women and she should be taken seriously. She wants to change the name for corrupt politicians in the United States. She will not bossed around and will not be bribed to do something that is not in the best interest of the country.